Robots to replace security guards - humans are also necessary! 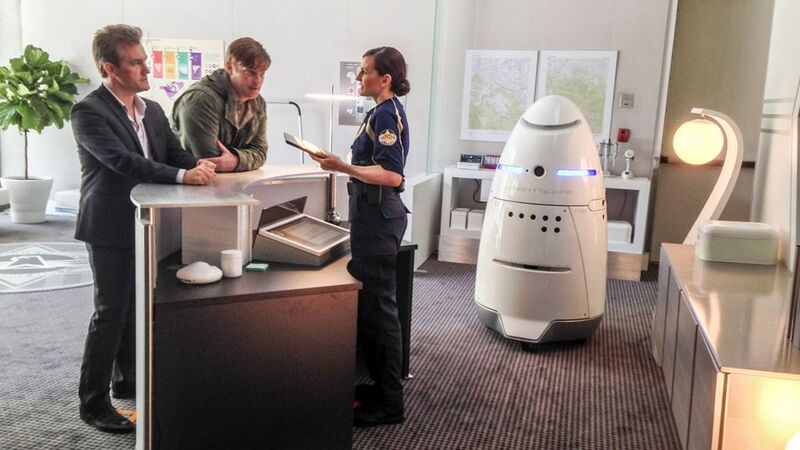 HomeBlogRobots to Replace Security Guards? I recently read an article on Mashable (originally published at http://www.technologyreview.com/news/532431/rise-of-the-robot-security-guards/) about how robots are possibly to be used instead of human beings as Security Guards, starting (where else?) in Silicon Valley, California. As you read through the article you notice that the technology the robots use is already commonplace. It’s just that the robot moves about, instead of being a fixed camera or sensor. The only benefit I can see is that a greater amount of area can be covered by a moving object with these technologies on board. As the article mentions, there are drawbacks, should the robot fall over a kerb, and be unable to right itself, unlike most humans do. For me, the real drawback of technology over human presence is the issue of response times. You can have as many CCTV cameras, alarms and sensors, either static or portable, as you like, but they’re only as good as the speed of response they provoke. A response to a call out may take as little as 10 to 15 minutes, but that is often not quick enough to stop a crime from taking place, or to prevent the perpetrators from escape. Yes, I love the technology, but in addition, you need manpower to be able to respond. Give me a human being every time!